Dr William Virtue of Virtue Dental Care in Yadkinville, NC offers general, cosmetic, and restorative dentistry options. His dental expertise includes using CEREC crowns for individuals who need dental restorations in a timely manner. When considering any treatment, you must weigh the pros and cons to make an informed decision. The same holds true when contemplating dental crowns. CEREC restorations are made of ceramic, not metal. Dentists who have CEREC technology utilize a milling machine in the office. The machine is used to create the crown while the patient is in the office. The crown can then be placed the same day, avoiding the need for multiple visits. There are advantages and disadvantages. CAD technology – Digital impressions are safely used to create the crown. This technology enables to dentist to match the surrounding teeth so the restoration appears natural. In office construction – Creating the crown in the office allows patients to have the entire procedure done in one visit without the need for temporary restorations. Single block of material – These crowns are made from one block of ceramic. The use of a single block makes the crown sturdy and less likely to chip. Safe – CEREC restorations do not contain metal and are safe for patients. No human touch – With digital technology, the restoration relies on computer generated creations. 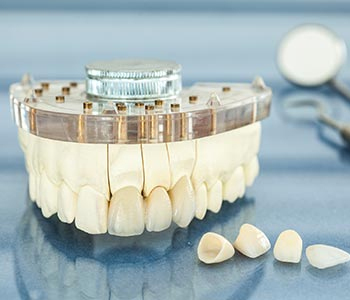 Not for front teeth – Without that human touch, CEREC crowns may not look as natural on front teeth and are better suited for back teeth. If you need dental restorations, contact Dr. William Virtue of Virtue Dental Care. He can help you decide if you are a good candidate for CEREC crowns. Virtue Dental Care Patients call (336) 679-2034 and New Patients call (336) 679-2034 to schedule an appointment.